Related items are interconnected in different ways. Select the desired connection method depends on how the pattern associated with the product, as well as the thickness of the yarn. Sew details of a special blunt needle using the same yarn, which is associated with the product. Thread a needle with blunt tip, knitting needle, hook, scissors, details of the product. 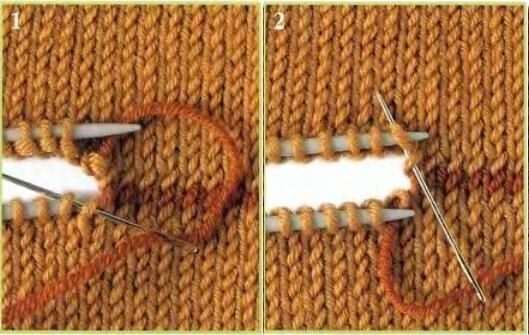 If you need to connect the back with the shelf, or to sew sleeves, use a vertical knit stitch. To do this, lay out the parts so that the face is at the top. Align the detailto the edges coincide completely. Start to connect the parts with edge loops composing ranks. Insert the needle into the detail of the movement from the bottom up, capturing the hinge edge of the first one, then the second detail, hook two stitches. The joint should be as eight. If the edges of the part are the hinges of the front surface, first, place your needle in the front loop near the edge, and on the other side of the seam as well hook the front loop. Please note that it is impossible to miss a single loop, shivaite them strictly sequentially, so the details are not straight. Also parts can be connected to conventional needles, this method is called intervention. When connecting in this way the first part ends and the second fit, joining the first in the process of vyvazhivanija. To do this in every other edge loop of the second parts promazyvaetsya along with the edge loop first details. If the thickness is not critical, you can purl and the two loops together so it will be stronger. Intermediate range fit as usual. If you need to connect the two parts horizontally, you can do it way "loop the loop". It's the perfect way to connect the parts with thick yarn, since the seam is invisible. Do not close the loops of the last row when connecting this way, or provarite another row after the last contrast thread below, gradually spreading to the thread, catching the loop with a needle. Details put opposite each other, preferably on a flat surface. Pick up the loop from the needles or yarn, thread through her needle and thread, then remove the loop from the other spokes or threads. Enter the thread with the needle alternately within each loop in turn from right to left. Stay tuned for even thread tension so the parts did not warp. Please note that the string you stitch the details, it is better to take with a reserve, so as to take out it in the stitching process will be very difficult. Details of the product before connecting need to wash, dry on a flat surface and to steam.